Wouldn't it be great to have two backing singers who fitted in your gig bag? If you can sing and play, this will widen your sound considerably with harmony vocals. Great sounds. Easy to use. Good price. No headphone out. Digital artefacts and phasing with dual harmonies. If you can't hold a tune the Vocalist Live 3 won't help you. The Live 3 can output in stereo and offers separate channels for guitar and vocals. Harmonizers and pitch shifters for guitar are relatively common. Take the DigiTech Whammy: a note goes in, it gets bent manually or automatically and played back against the original note. Shift that basic idea to voices and you get something like this, the Vocalist Live 3. Its predecessor, released in 2007, bore parent company DigiTech's name. The new one is simply branded 'Vocalist', with an updated feature set and a smart new look. So who fancies a little sing-song? Three-part harmony vocals is what this is about: your voice plus two others, generated by the onboard musIQ technology, a trademark of 3dB Research Ltd. Simply plug your guitar and a vocal mic into the Live 3, and it uses your singing and guitar chords to create two extra voices. And - gasp! - there's no programming. Well, not much. You can select one of six interval pitches for the harmonies on both of the secondary voices. The exact intervals aren't specified because they vary slightly depending on what chord you play, but the labels give you the idea: bass, lower, low, double (unison), high, higher and octave. You can choose more male or female sounding harmonies, and whether you hear one or both. So, you could have two virtual girls singing high, two blokes singing low, one girl-boy in unison or any other combination. You can store your settings in up to five user patches, each one with footswitchable A and B part options. That enables you, for example, to sing the verses alone, the bridge with a single harmony, and then the choruses with both harmonies for full effect. Vocalist has included a 'humanize' control, which loosens the pitch and timing of harmony notes. You also get real-time pitch correction, which works on a 12-note chromatic scale - it'll pick the harmony note and anchor it there mechanically with a jump, so go easy on the glissando and vibrato or things can sound a bit comedy Cher/ Vocoder-esque. 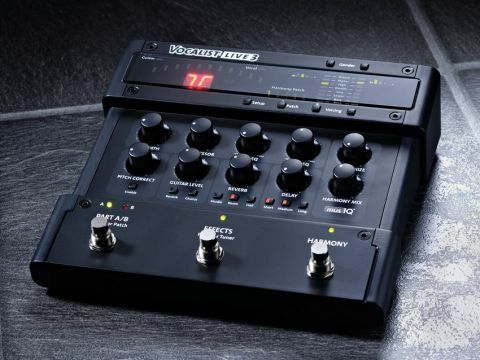 The Live 3 is also a dual-source preamp for voice and guitar for connecting to a PA. As such you also get some useful tools, including a compressor, a warmth control for adding tube-preamp-style grit, two-band EQ, low-cut filter and an adjustable noise gate. In addition there are also three reverb settings, plus five delays ranging from 90 to 750ms for vocals, and optional chorus for the guitar. The guitar input also has high and low sensitivity inputs to deal with different pickup strengths. Given its design as a plug-and-go live performance tool, the Live 3 foregoes the stereo mini-jack headphone socket and MIDI capabilities of the VLD3 desktop version. MIDI is (still!) anathema to most guitar players anyway, but a headphone jack is an annoying omission - it would be useful for practising. The Live 3 can send the guitar signal with the vocals or separately, which is handy because no soundman wants guitar and vocals on the same channel. What you can't do, however, is send the harmony vocals separately from the main voice, so that mix decision is down to you via the top panel. Thank heavens for the onboard tuner. Going gung-ho without checking your tuning is a no-no because the Live 3 requires you to play in concert A440 pitch, and that your guitar is tuned accordingly. DADGAD and so on is fine, as long as you're relatively in tune, chromatically speaking, to A440Hz. First test: set one harmony to high (roughly a third above), sing an E note over an E major chord and lo and behold, the high harmony comes out at G# - the major third in the scale of E major. Change the chord to E minor while singing the exact same note and the harmony flattens to G, the minor third. Simple, but it'll still amaze you. Adding the second harmony (low and high) is a stacked chord starting place for all kinds of pop and country duties, but if you have a sensitive mic you'll also perceive some digital artefacts and some phasing issues, as the Live 3 looks for harmonies when you're not singing and in quiet patches. The noise gate is useful in this regard, but recording the left and right outs helped us analyse what's actually happening. It revealed that while single harmonies sound lifelike and realistic, two extra parts don't stand up to recorded scrutiny. This is much less an issue in the added noise and hubbub of a live environment - what the Live 3 is designed for. Some of the more extreme harmony settings - bass and octave - can end up sounding slightly comedic if you're not careful, but it's all about understanding the unit and matching it to your own songs and voice. Slower, more definite notes bring better results than more complicated vocal parts and super-quick chord changes. In that respect, Eagles/Crosby, Stills And Nash stuff is all possible, as are more simple Everly Brothers-type effects. Turning the 'humanize' control fully clockwise sounds like your backing singers have been getting drunk with robots, while fully anti-clockwise sounds tight and regimented: we tended towards nine to 11 o'clock on the dial. You need to use this carefully with the pitch correction function and balance their effects. The additional controls are useful too: bass and treble EQ and low-cut for obvious reasons, while the compressor adds a more 'finished', result to vocals when used judiciously - meek songstrels take note as this can give you some added presence and dynamics. Likewise the reverbs and delays and indeed the chorus for the guitar. There are enough parameters to get good sounds, while not confusing the issue. In the real world of pub gigs, while the footswitches are solid enough and all the connections are secured to the chassis, those little plastic push switches will let in the horrors of spilt pints, however, and get gunged up with the residue in no time. So be warned if you inhabit the world of drunk, close proximity punters. Apart from that, this is very well spec'd, excellently laid-out and easy-to-use tool. If you can't hold a tune, the Vocalist Live 3 won't help you - you must be able to sing in tune, and indeed know what you're singing… and be able to do all of the above over the right chords on the guitar: wrong chords means wrong harmony. Assuming you've ticked those boxes, the Live 3 can deliver impressive results if you stick to its principle strengths - overuse it at your peril. It's as much an effective live performance tool as it is a good singing teacher, all wrapped up in a good two-channel preamp that'll feed straight to a live PA or acoustic/full-range combo.